I've been trying my best to not buy any more eyeshadow palettes for a while unless they're completely different from ones I already own. 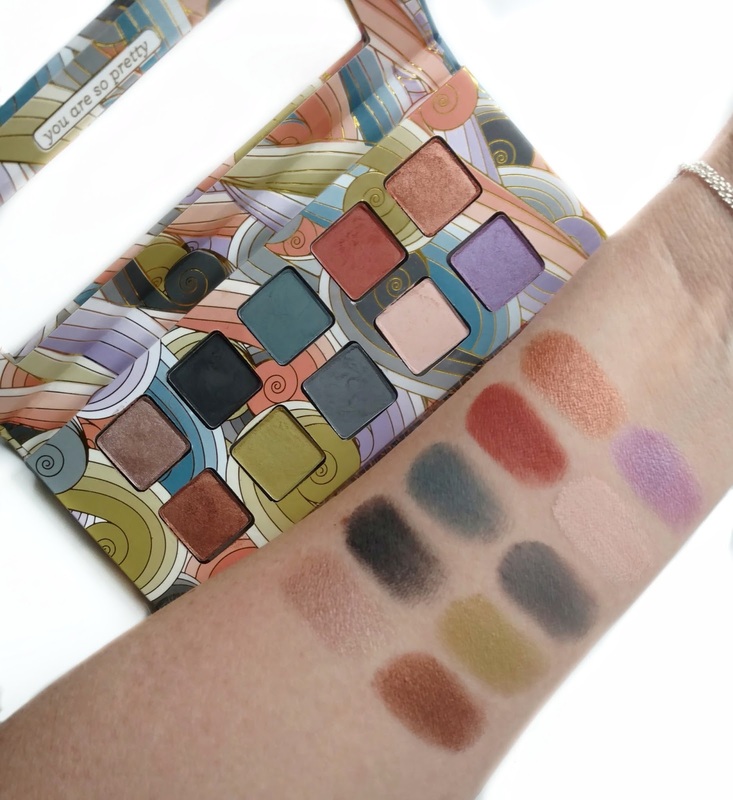 So when I saw the new Beachy Punk Palette ($14) from Pacifica at my local Ulta the other day, I knew it fit that description because I own very few colorful eyeshadow palettes. I typically wear neutrals on my eyes and shy away from color but one of the things that drew me to this palette was that the shades are colorful but not bright, so I guess that makes them more wearable in my mind. 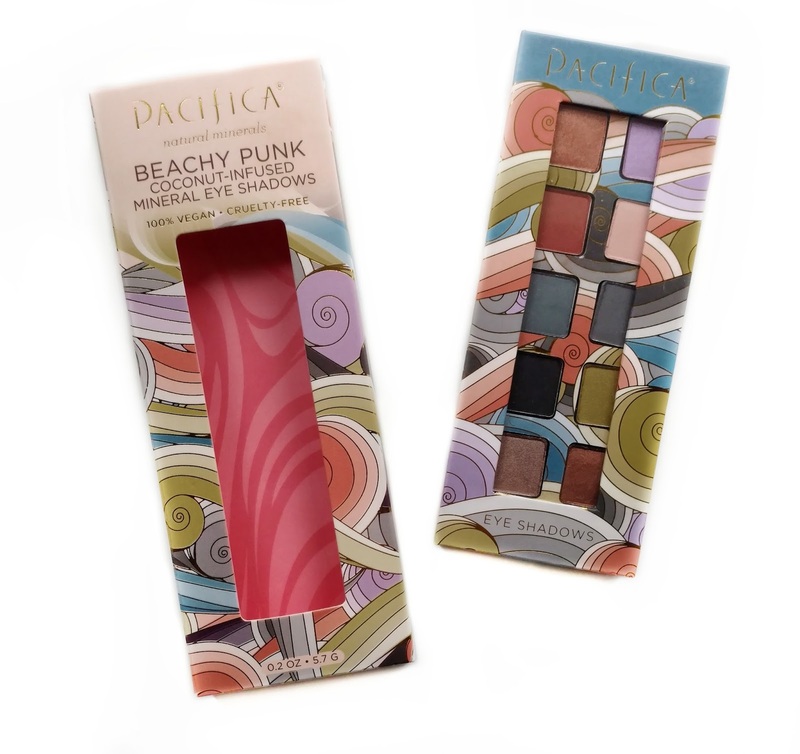 I also have never tried Pacifica eyeshadows before and the price was right. Some of the things I love about Pacifica as a brand is that they're made in the U.S.A. and they're cruelty free. 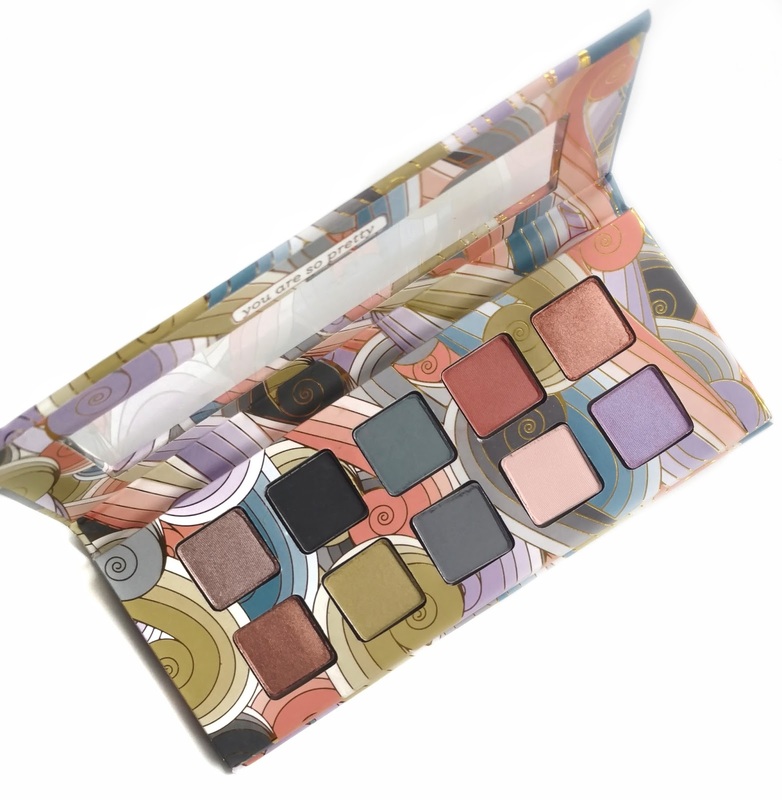 This palette is 100% vegan and doesn't contain any talc, parabens, animal ingredients, petroleum or phthalates. 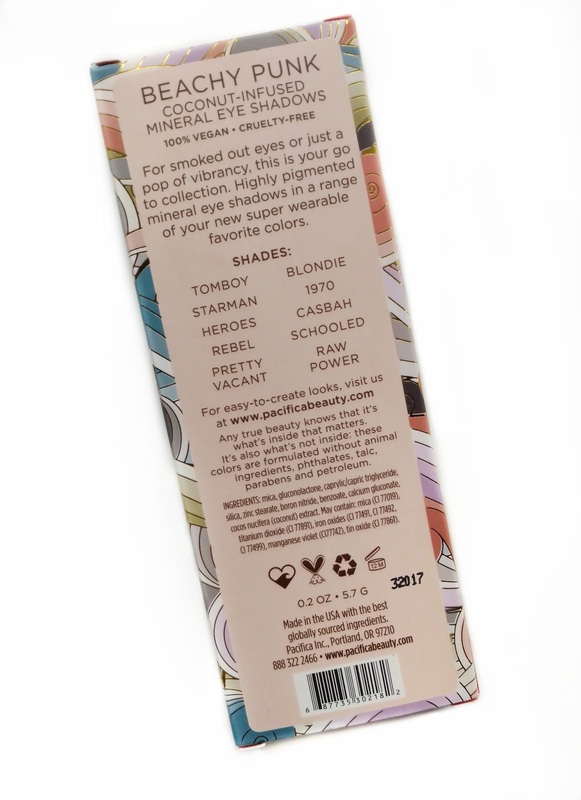 The back of the outer packaging lists the shade names and ingredient information. The palette itself is made of cardboard with a plastic window on the lid instead of a mirror. Inside, there are ten square pans and one of the first things I noticed is that some of them were glued in crooked. At first I thought they were loose but when I stuck my nail in the side of the pans to try to straighten them, they didn't move, so they're basically just glued in like that. In a way, I don't really mind, as it kind of adds to the eclectic vibe of this palette. As far as the formula goes, I thought most of the shades swatched nicely. My swatches below aren't over primer, but they are over moisturizer (which I always put on before swatching so my arm doesn't look dry). Some of the shades, particularly the mattes are very pigmented. Standouts are the brick red and pale pink matte shades...they went on intensely in one swipe. The matte blues have pretty decent pigmentation but need to be built up a little bit, otherwise they have more of a washed-out look (which could be a good thing if you don't want an intense color on your eyes). The navy blue was a little disappointing...it was more dry and dusty than the others and required a few swipes to get the intensity I wanted. The shimmery shades are very soft and pick up easily with a brush, but they are more powdery so I would suggest using a primer with this palette to give them a base to stick to. 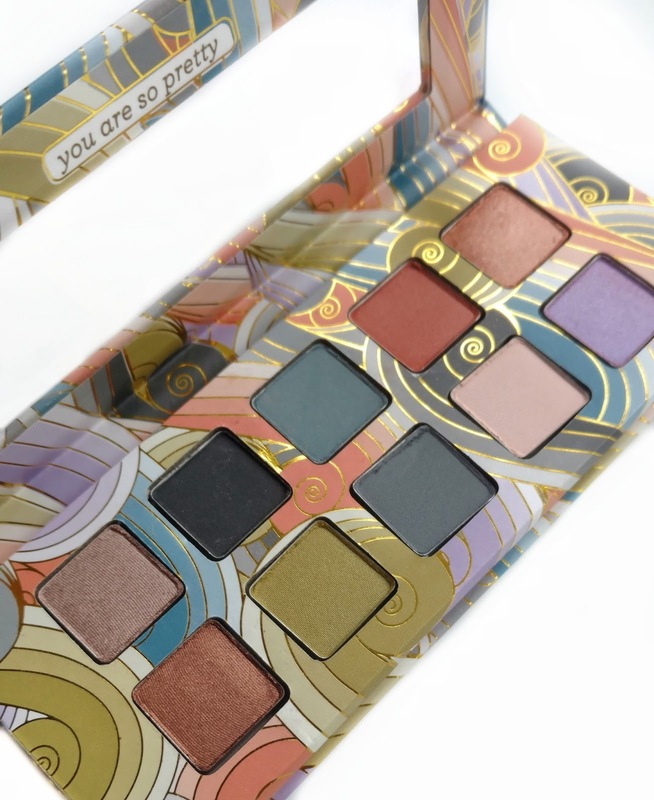 Overall, I think you do need to use a primer with this palette and some of the shades require you to build them up a little if you want more intensity. But that's not really a big deal for me because I always wear a primer anyway. They also pick up easily with a brush (they're not hard) and blend nicely. Keep in mind this isn't a high-end palette that goes on effortlessly no matter what you do, but as far as affordable options go, I think it's a good one...and it's all-natural which is awesome! This palette is so pretty and a good price. It's different than any of the palettes I currently have so I may get this. Do you think the $3.50 Ulta coupon will work on this? Your blog is kicking a$$ lately with all the great posts. I haven't been too keen on YouTube nowadays because they all talk about the same things and are sponsored by the same stores. I started looking for blogs to read (going old school) and I'm so glad I rediscovered you!! I went to your old site and realized you moved. 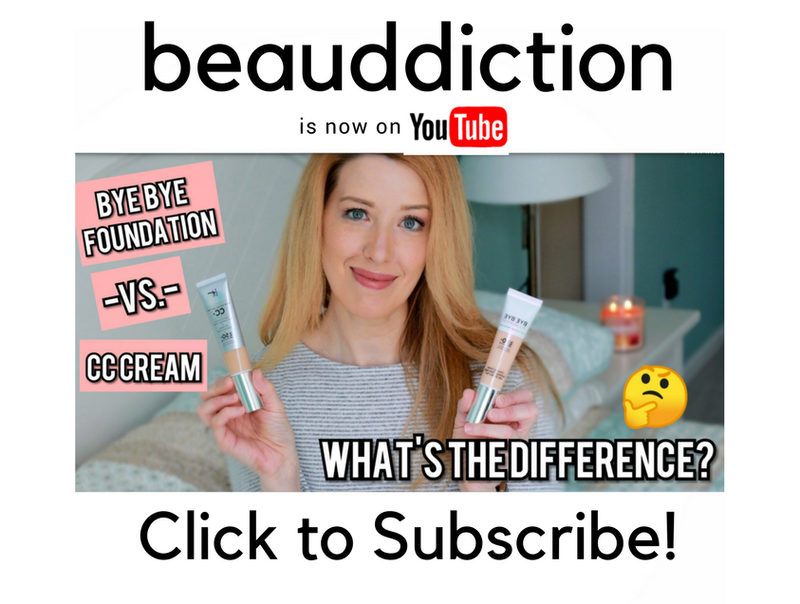 You have a unique view on beauty and I love it, please stay true to yourself and don't do any sponsored Nordstrom posts. I'm so sick to death of those! This is such a cute palette! I agree that it seems very wearable and even though there's some color there it's more muted. The blues aren't bright and would probably look more grayish blue on the eyes. I'll be checking this out next time I'm in Ulta.